Declan Welsh. Photo: Colin Usher. 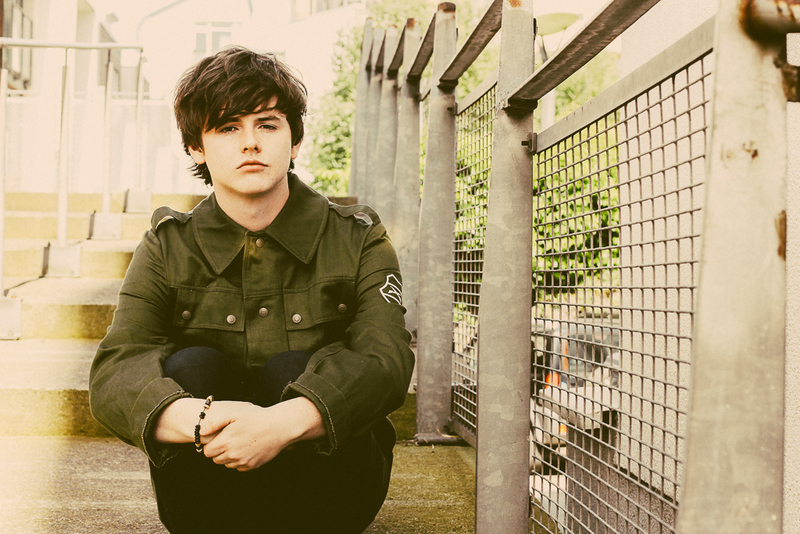 Declan Welsh is one of the most unique emerging local acts – his musical storytelling prowess has earned him the title of ‘the voice of a generation’. The Strathclyde law student has been selected to support Glasgvegas at their Old Fruitmarket gig on 21 December, quite a departure from the usual intimate venue atmosphere. The 21 year old singer/songwriter has been making a name for himself since the launch of his EP “Glasgow in the Sun” in February 2014. He was taken under the wing of industry supremos Kenny McDonald (The Proclaimers Manager) and Tam Coyle, one of the most respected Scottish music entrepreneurs, who promoted the first Glasgow gigs of bands like The Jesus and Marychain and The Stone Roses. Declan’s social activism, supporting charities such as Quarries and sharing ideas on stopping child poverty, is reflected in his stories of Glasgow through a witty, satirical eye, from tales of partying in Sauchiehall street in “Should have Stayed Home Tonight” to his brutally honest response to cynicism and disenchantment in “I Don’t Want To Grow Up to Be Like You”. We caught up with Declan to chat about the upcoming gig with Glasvegas, the dual lives of musicians and of course, his music and poetry. Lyric based stories, catchy tunes. In bands since I was 16 but I’ve been doing solo things for about two years. Lawyer by day, musician by night? Well, I just got a mark back that proved you can definitely manage music and uni BUT not to any great extent. Law is quite flexible but I’ve definitely learned to take a lot of information at very critical moments, to put it diplomatically. The decision of one over the other might come in the future but for now I’m determined to juggle both. I’ve done a few poetry nights now. I recently did one through the National Collective, I performed at Yes!tival, kind of scathing things about David Cameron and Nick Clegg. It travels better than I thought it would. We went to Shetland and I was on a boat with a fisherman who I could barely understand, I’m sure he felt exactly the same towards me. Naturally, I thought ‘Oh God, this is not going to go down well,’ I mean singing about Sauchiehall street. To my surprise, it was actually received quite well, I guess there’s a bit of universality to it. It depends, sometimes I get lyrics in my head and I try to put a melody to them, sometimes it’s the other way around but the lyrical side is always very important. I base everything on personal experience, it’s the easiest to draw from.Obviously massively embellished, I don’t lead an even nearly enough exciting life to document in song. Tell us a bit about your EP. I released an EP about 7 months ago, it’s called ‘Glasgow In The Sun’. I think it’s sold out quite recently but it’s still available online. What should be the first song to listen to? ‘Alright’, let’s go with that. Or ‘Should have stayed home tonight’. I start gigs with that one, so maybe that would be the best one to go for, that’s the most indicative of style. What’s your favourite gig so far? The EP launch at Roxy. It’s a tiny venue and it was absolutely rammed, everyone was there, people were singing along to the songs, the reception was really good. Very different to being in a band because these songs are genuinely mine, so 150 people singing those songs back to you is an amazing experience. And then Squeeze, well, because it was Squeeze. The Yestival gigs were amazing too. Obviously, in hindsight, it’s kind of sad to think about it but at the time it really felt like it was going to happen. The energy of that place was incredible. How did the Glasvegas support come about? Our managers were booking gigs, I was booked with them before to support Squeeze. So they asked me if I wanted to do Glasvegas and of course, I said ‘YES.Definitely.’ So thank you, Regular Music. What can we expect from that gig? The Old Fruitmarket is an amazing venue, it will be absolutely amazing. The support band Oh Jonathan look really good too. There’s definitely similarities between me and Glasvegas so hopefully there’s a resonance with their fans, talking about the daily life in Scotland and the UK, so I’m sure there will be something to relate to. I’ll do my best to get people up for it, hopefully the solo act and the lyrics will strike a chord. Posted in Music and tagged declan welsh, Gigs, glasgow bands, glasgow gigs, glasvegas, Interview, kenny mcdonald, local focus, Music, songwriter, students. Bookmark the permalink.